Bolivia is a landlocked country about twice the size of France. Tropical lowland accounts for 70 percent of its area while the remainder is the better known part with spectacular Andean ranges and highlands. The huge Beni region in the lowlands is slightly larger than England and Wales combined and in 1957 had a population of only 119,000. 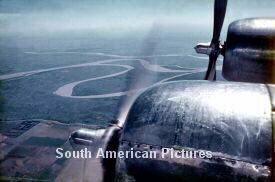 It is dominated by Amazon tributaries, lakes, immense grasslands and tropical forests. 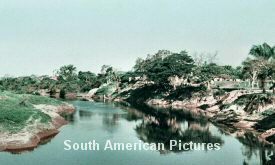 Back in 1957 the Beni was totally isolated except by air or by raft or boat from roadheads at the foot of the Andes mountains. 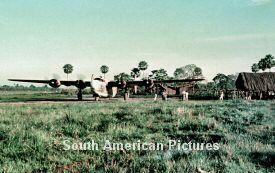 These pictures were taken by the late Dr.Franz Ressel a Bolivian cytologist and cancer specialist who accompanied German film maker Hans Ertl on an expedition as interpreter, assistant and medical officer. He used a Werra 35mm camera made by Zeiss Jena in the German Democratic Republic and a variety of film stock including Agafacolor [then a diapositive film] Kodachrome and Anscochrome. All the exposed and unexposed film was kept as cool as possible in the average 80F [26.7C] tropical heat. Silica gel was used to prevent damage by the severe humidity to which all the equipment was exposed for four months. 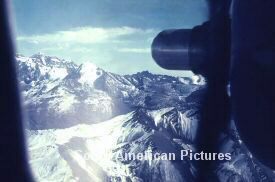 Some film was processed in the cooler climate of the highland capital La Paz and some was sent to the USA. The transparencies were later kept in the best possible atmospheric conditions but even so after more than forty five years in storage they were found to have been damaged extensively by fungus and the inevitable colour 'shift' towards magenta. Careful treatment by software has restored much of the original quality. The black + white [monochrome] negatives were in near perfect condition. Many Beni settlements are beside rivers. 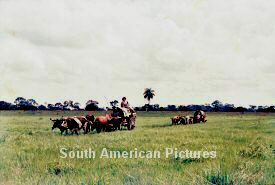 This estancia or ranch is at 'Lomita' on the Cocharcas River, an Amazon tributary. 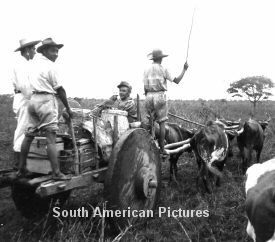 Large parts of the Beni are llanos, flat open grasslands In 1957 an ox drawn cart 'carretón' with wooden wheels was the normal transport. 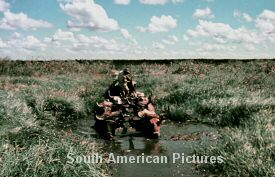 Here a carretón is crossing a swamp - or curiche An 'all wood' carretón would float or semi-float in the deeper curiches. A journey around the ranch could take many days even on firm ground. 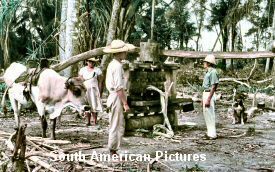 A trapiche or sugar cane press worked by oxen harnessed to a beam. The animals walk in a circle so turning the press. 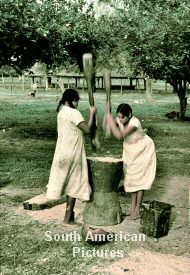 Women of the Beni [Benianas] pounding rice in a large wooden mortar there known as a tacú. 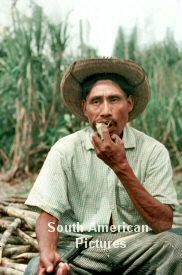 A local man [Beniano] chews sugar cane after the zafra - harvest. Semi nakedness was not unusual for many of the local women in the 1950's . This young girl worked on the estancia and is grinding rice in a tacú - a mortar made from a sawn log from a tree. The Beni is home to many native American peoples. In 1957 some were still very tribal and like this Siriono woman followed traditional ways. She has a face painted with a paste of urucú , [Bixa orellana] and is smoking a pipe with native tobacco. Large parts of the Beni grassland are used for cattle ranching. 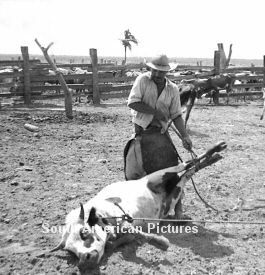 Here a steer has been caught with a lasso. 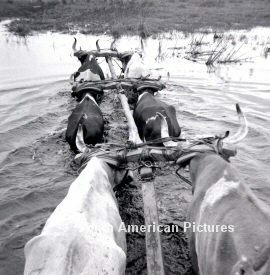 When the cattle were being driven and had to cross a river the herd was kept tightly packed. 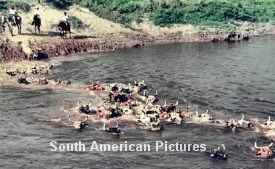 Sometimes one animal was killed to draw away the piranhas -the voracious flesh eating fish. The cattle were slaughtered at the ranch and the meat was taken by air to the highland markets and to feed miners in the state-run mines. 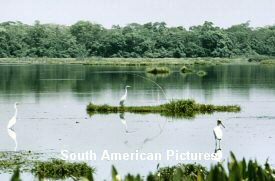 With many swamps and lakes scattered across the Beni wildlife was abundant. 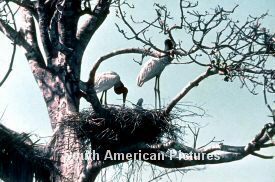 Here a pair of Jabirú storks Jabiru mycteria are at their nest of twigs with a single young. Herons and a Wood Stork looking for food on one of the lakes. 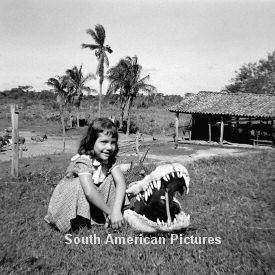 A young girl poses to give scale to the skull of a giant Black caiman -Melanosuchus niger. When alive the reptile was in excess of 6m long. 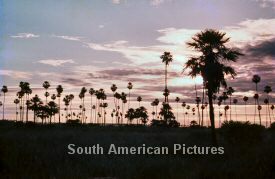 A palm savannah: grassland scattered with tall slender palms.